The Aspire Madison County team walked on Sunday, September 11, 2016 to help raise awareness for Suicide Prevention. We had a team of 17 members and we had 14 walkers on Sunday. It was a beautiful day for this first annual event in Madison County. The program began with a moving tribute to those lost on 9/11/01. 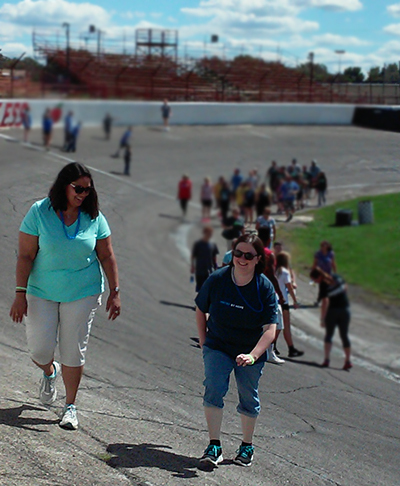 We then gathered and walked at the Anderson Speedway with hundreds of other people, many who wore beads or personalized shirts indicating that they had lost someone to suicide, had thought of suicide themselves or were there to support those who were seeking answers. As a team we manned a table, handing out literature about the services that we offer at Aspire and we raised over 1,000 dollars to help spread the message that there are alternatives to suicide. It was hopeful to have this kind of support as the Madison County Coroner, Marian Dunnichay reported in The Herald Bulletin that between 15 and 20 individuals commit suicide in Madison County each year. The Out of the Darkness Walk has been held for many years in Marion County, but this was the first year that an Out of the Darkness Walk has been hosted in Madison County. For further information regarding suicide prevention, or other Out of the Darkness Walks, please go to the American Foundation for Suicide Prevention at https://afsp.org/ or if you are in crisis, please call 1-800-273-TALK (8255) or call the Crisis Line here at Aspire at 1-800-560-4038. Volunteers are needed to help with maintenance of the Harvestland Farm Trail. If you have any tools such as rakes, shovels and wheelbarrows, please bring those as well. We'll provide donuts, coffee and cider so come out and be a part of a great community for a great cause. Watch for more detailed information soon. This is an opportunity to come together as an organization to do something special for the residents of Bush and May Houses, we hope you will join your coworkers and community in making a difference! We hope to see you there! We're located at 6775 SR 32 in Anderson, IN. We celebrated the opening of Aspire Manor in Lebanon, IN! This historic building was constructed in 1919 and was called the, “Brown McDaniels” building, and will now provide 12 apartment units for formerly homeless individuals and individuals with serious mental illnesses in Boone County. The renovations to these apartments are simply beautiful and we are excited for residents to move in. Renovations are underway at our Hudson Group Home! Hudson was built in 1991 with a very unique design. Hudson originally was designed with three units. Each unit has a kitchen, dining room, living room, laundry area, four bedrooms and two bathrooms. This set-up is no longer conducive to the needs of the residents, thus promoting a recovery model. The vision of the remodel was to have one large kitchen, one dining room, several sitting areas for the residents and create more functional office space for the staff. The decision not to remodel the existing bedrooms was due to preventing resident displacement. Approximately, two years ago Hudson was granted refinancing through Aspire Indiana, Inc. This refinancing did not come easy as it went through HUD review and scrutiny. With the help of legal counsel, Tom Beeman, the HUD loan was successfully granted as well as approval of requested renovations. Architect, Mike Halstead, developed designs to meet the needs of residents as well as staff. A group of Aspire staff involving maintenance, housing and clinical were able to agree on a design that was functional. With the help of the Aspire Executive staff, a design was approved. In late spring 2016, Fredericks Construction was selected and approved. Fredericks Construction and Halstead Architect held a meeting with current residents to explain a three phase construction plan. Each resident was given a “hard hat” and able to ask questions regarding the project construction. A second meeting will be held prior to phase II so that residents are familiar with next steps. Construction of Phase I began on July 18th, 2016 and is nearly complete. This phase consists of re-configuring one of the kitchens and dining rooms into office space and storage. Phase II will consist of re-configuring the large staff office and second kitchen into the living room, media room, sitting area as well as the kitchen. This phase will be a little bit longer to complete than the phase I and III; however, the end results will be beneficial to the residents and provide an open type living environment. Phase III will complete the renovations, converting the third kitchen/dining room area into a med office, laundry area and additional office space. We are grateful to have such a wonderful crew working on this project for us and excited to renovate this home for the residents! Be sure to checkout the Housing Facebook page and keep up on the progress! Anticipated completion is December 2016! What if your health and well-being depended on $60.65? Did you know that the average amount of assistance provided to our HIV clients through the Direct Emergency Financial Assistance Program (DEFA) is only $60.65. These funds are provided through a grant from the Health Foundation of Greater Indianapolis and are raised through the annual Indiana AIDS Walk. This year, Aspire Indiana Health HIV/AIDS Services Team participated in the Walk to help raise awareness of HIV/AIDS in Indiana and to help raise funds for the DEFA Program. The funds raised from this annual event are used to provide our HIV+ clients with services and items that can’t be met through other resources. So far this year we’ve provided two homeless families with hotel stays during the coldest months, we helped a family pay for funeral expenses for their loved one who passed away, we purchased work boots for a client who was recently incarcerated but is now employed, and we’ve purchased many cans of nutritional supplements for clients with extremely low CD4 counts who are having trouble meeting their nutritional needs. The Walk was held on Saturday September 24, and it was a perfect day for a walk. It was a great day for meeting up with old friends, being introduced to new friends, and getting together to celebrate the lives of those who have been impacted by HIV/AIDS. To help raise funds for the event, we participated in a Penny Wars with other HIV Care Coordination providers around the state…and WE CAME IN FIRST PLACE! (Although the final count for funds raised is still being tallied). We’re already saving for next year’s Walk! Save your pennies and change and donate to the Aspire Indiana Health HIV/AIDS Services Team! We promise it will go to a good cause! Come out to Harvestland Farm! Have you been out to our new Harvestland Farm Store? If not, come out and visit! We're located at 6775 SR 32 in Anderson, IN. We have a wide variety of organically-grown foods and delicious snacks. Stop by on your way home!